Within a two-block radius live three elementary-age girls. Each is being reared by her natural father or grandfather, or an adoptive step-grandfather. They’re the type of children for whom you want to do what you can to brighten their lives. And, they have the type of guardians you want to help, too. So, what can a painter do for remarkable neighborhood girls like them? And, how can a painter help out their caring and hardworking parental figures? WELL, HE OR SHE CAN PAINT! All of the girls lived in rented duplexes. Thus, redecorating needed to conform to the tenant rules of the respective property owner. Paint colors and products had to be selected and used that would be (a) easy to recoat when the current tenants moved, or (b) color-compatible with a new tenant’s needs. And, the products had to be child-safe. Non-toxic, non-flaking, non-flammable, non-“rub-offable.” Washable, too! All three girls chose their paint colors from Glidden’s® “Make It Magical with Disney” line. WALLS: Base Color no. WDMN05, Color name: Minnie’s Gloves (white). Special effects: 3 horizontal wrap-around stripes, two adjacent walls. Top/4-inches: Color no. WDMN04, Color name: Adorable Daisy. Middle/6-inches: Color no. WDMN08, Color name: Bow-tique Beauty. Bottom/12-inches: Color no. WDMN09, Color name: Purple Cuteness. DOORS/TRIM: Color no. WDMN04. Color name: Adorable Daisy. WALLS: 3 walls: Color no. WDFY04, Color no. Vidia Purple; 1 wall, bookcase and closet: Color no. WDPR03 (white), Color name: A Wave of the Wand. Special effects: 4 to 8-inch diameter circles, positioned in shooting star effect from white wall onto adjoining right-hand closet wall. Color no. 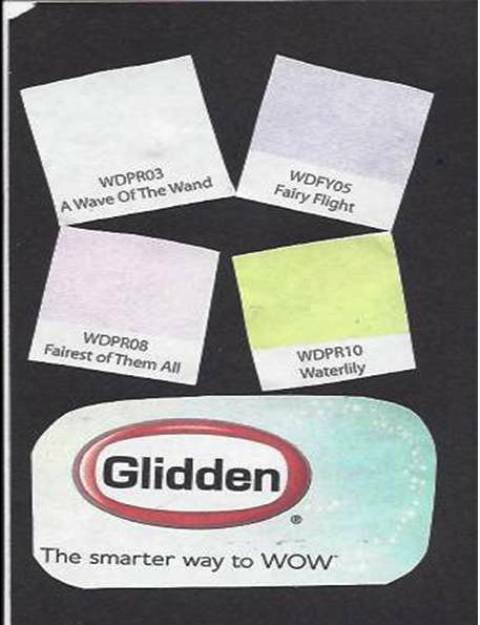 WDFY05, Color name: Fairy Flight; Color no. WDFY09, Color name: Pixie Purple. DOORS/TRIM: Color no. WDFY05, Color name: Fairy Flight. WALLS: 4 walls: Color no. WDPR03 (white), Color name: A Wave of the Wand. Special effects: 2-inch wrap-around border: Color no. WDFY09, Color name: Pixie Purple. DOORS/TRIM: Color no. WDFY09, Color name: Pixie Purple. WOOD FURNITURE: Color no. WDFY03 (white), Color name: A Wave of the Wand. Special effects: Tops of desk, 2 nightstands, 6-drawer dresser: Faux Swirl Pattern: Color no. 1: WDFY05, Color name: Fairy Flight (pastel lilac); Color no. 2: WDFY01, Color name: Tinker Bell (mint green); Color no. 3: WDFY09, Color name: Pixie Purple. Paint products: Semi-gloss and Gloss latex. 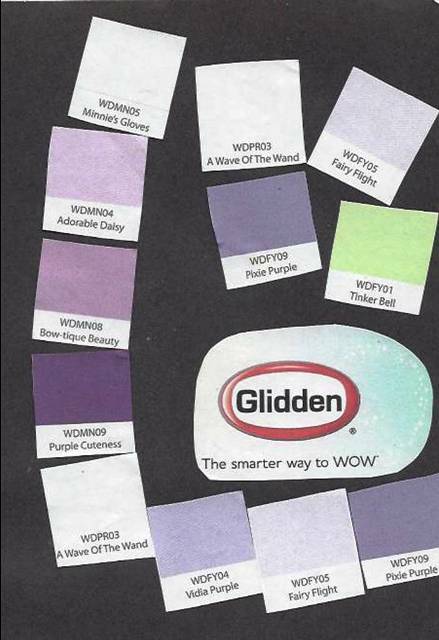 Manufacturer: Glidden’s. Stain and finish coat products: Miniwax. First Things First: Scheduling and Clearing Out Rooms. Painting schedule: Week days (for each), when respective family gone for day. Clearing out: Adults (household and friends) removed wall posters, banners, pictures. They also removed table lamps, small chairs, mirrors, small shelving units; toys, stuffed animals, games; clothing and personal stuff; bed linens, pillows, curtains, small area rugs, etc. Paint Project Process for Each Bedroom. Vacuuming: Room and closet. Thoroughly! Also, cleaning/dusting all furniture to be painted. Prepping: Minor patching, filling small cracks and nail holes; light sanding. Desired finish effect: Fresh, color-chip match; distinctive. New! * New coordinated and washable cotton blend curtains. * New quilted coverlets or bedspreads, and decorator pillows with removable covers. * Two complete sets of coordinating bed linens, and 1 set of bath linens. Girl No. 1’s Room: 9-ft. x 12-ft., Donors: Out-of-town relatives. Girl No. 2’s Room: 12-ft. x 12-ft., Donors: Deceased mother’s aunt. Girl No. 3’s Room: 12-ft. x 15-ft., Donors: Group of grandfather’s friends. Biggest reason to take on a joint project like this? Three girls starting out in life, and their three guardians who are willing to sacrifice a lot help them take each step into the future. Thanks for doing what you do, including painting, to make life better for someone else.